The bitumen strip bisecting the old township carried almost 11,000 vehicles a day, but since the Brighton Bypass opened late last year the number of vehicles using it has dropped to under 6400 a day – a decrease of 42 per cent in total traffic volume, with a 52 per cent decrease in commercial vehicles.Time indeed for the residents of Brighton township to reclaim their main street. And they’re doing it in style. Local residents, business and students joined in the celebrations with a free street barbecue, a performance by the Jordan River Learning Federation (JRLF) band and a visit by some furry friends from the JRLF School Farm. The street party coincided with the official opening of the local health centre. 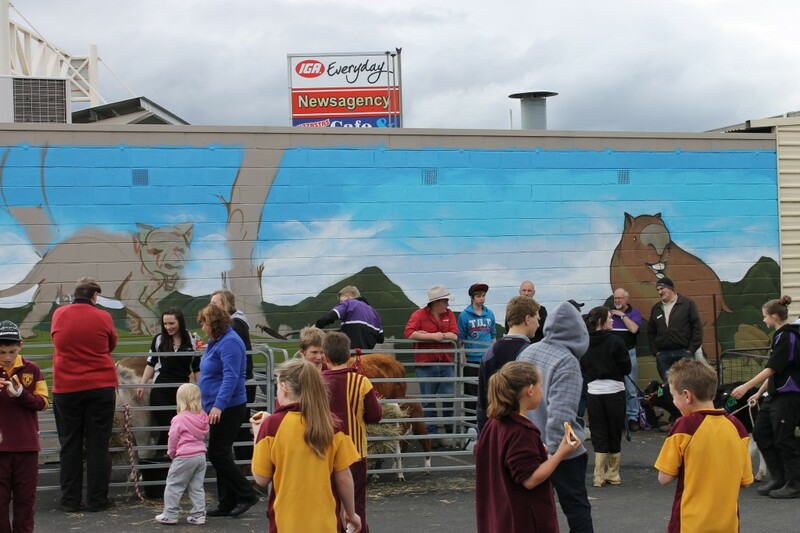 The former health centre, which is now vacant, was adorned with an 11m x 3.3m mural painted by Lukan Smith. Eighty large colourful cut-outs of native animals have been created by local students. These have been placed along the former highway. And members of the Workskills “work for the dole” program have built moveable outdoor furniture to add to the amenity of the street. Brighton Mayor Tony Foster said of Brighton Township’s new look: “It’s great to see the local community re-engaging with the hub of their town. Local business owners are talking to each other and children from Brighton Primary School and the Jordan River Learning Federation have contributed to the beautification process. Brighton Primary School principal Tony Fagan said 136 of his students had worked on the cut-outs. Brighton Council has plans to further improve the streetscape. The 200m strip from Bedford St to Andrew St will be narrowed to allow for safer pedestrian movement including traffic islands as well as more parallel parking on both sides of the street.